Social media always seems like something spur of the moment, sporadic, impulsive. Why else would we have Twitter rants? But when it comes to posts that promote your Threadless Artist Shop and your designs, your content should be a little more thought out and curated as a way of representing you and your brand. And one way of doing that is by planning it ahead of time with a social media posting schedule or calendar. A social media calendar is a great way of making sure you never miss a post opportunity, saves you time, lets you see what’s working (or NOT working), and helps you stay organized, which means better content! Here’s how to schedule your posts and get the most out of your social media. Why have a social media posting schedule? Content really is king! The images, promos, and writing you put out there (even if it’s just 140 characters) are your key to peaking peoples’ interest. Solid content – blog posts you create, sharing an article by your favorite blogger, clever promo posts, etc. – give people a reason to check you and your product out, to keep coming back and checking in, to share your posts, etc. The 411 rule: there should be 4 educational or fun posts for every 2 promotion-y posts. The 5-3-2 rule: post 5 cool things you find, 3 things from you, and 2 personal posts. The 30/60/90 rule: 30% of your posts should be your content (designs, blog posts you write, lifestyle photos, etc. ), 60% cool content you find and share, and 10 promotional posts (lots more like these in Buffer‘s post). And you thought scrolling through Tumblr just for fun ate away time! Scrambling to post interesting content every day can be insanely time-consuming, stressful, and can effect the quality of your content. When you pre-plan your posts, you shave away a ton of time every day that you would otherwise waste on trying to come up with blog posts to share, hashtags to use, the perfect Jeff Goldblum gif to use, etc. on the fly. Silly daily holidays your audience would enjoy a post for (like #AlienDay or #MaytheFourth), celebrity birthdays relevant to your audience’s interests (like wishing your favorite Doctor from Doctor Who “happy b’day”), and memes (a picture of Justin Timberlake on April 30th) are easy trending hashtags to jump on that can put your content in front of a lot of new eyes. Knowing what you need for photos ahead of time allows you to plan rather than scrambling together a photoshoot on your iPhone. This is especially important for promos – they don’t last long and you want to make your product look good, so you want to be prepared ahead of time with amazing photos! This gives you time to order whatever products you need at the base cost, flex time in case Murphy’s law interferes, time to get a location and gather models, and wiggle room for a redo if a photoshoot doesn’t turn out great. Having a companion promotional planning calendar is also helpful. Looking at both calendars will help you know when to promote certain products and designs through social media. We’ve all heard those horror stories of someone running the social media for a company who tweets something out in bad taste or has a reeeeally unfortunate typo happen before they can catch it. Rushing your posts risks this – planning them out gives you time to proofread and think. When you plan your social media, it also allows you to keep track of which posts worked really well and which ones fell flat. This allows you to improve your future content and nail down what your audience wants to see most! You can make a note in your calendar of which posts got the most likes, comments, engagement, etc., which you can usually check out right in the channels (like that little bar graph you always see on your Twitter account), or with Google Analytics. What should go on a social media calendar? Weird, silly, and random holidays: Never feel the FOMO regret of missing out on this! For example, if you have a beer design and it’s #NationalBeerDay, tweet it out! Or if you don’t have a beer-related design but you have an audience that appreciates all things nerdy, tweet out a gif like this one from Shaun of the Dead. Events relevant to your audience (and you! ): Going to a cool drink and draw? Or are you going to have a booth at a comic convention? Tell your audience to stop by! It promotes you, gives them cool things to do, and shows you want to engage with them! Themed weekly posts: #TBT, #MondayMotivation – you know the drill with these. You can also make up your very own: #caturday, #SundaySketch, #WatercolorWednesday, etc. 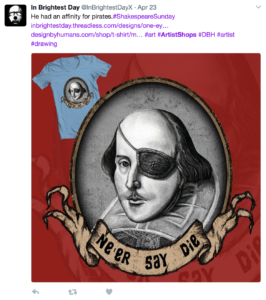 An example of a weekly hashtag, #ShakespeareSunday on @InBrightestDayX’s Twitter account. Product releases: Anytime you have new products or new designs launched or added to your shop, let the world know! You can also tease product releases to build some anticipation. Promos and announcements: Everybody loves a sale, so promo time is a great time to get your best content out there and really sell your stuff – figuratively and literally. And of course, anytime you have news, share it! This can even be as simple as telling people that you changed your shop’s featured image or that you added an ‘About’ page and they should check it out. Content they’ll enjoy from elsewhere: The content you post shouldn’t all be sales-y, but it also shouldn’t be solely content you created yourself. Make your social media a go-to spot for your audience to go and find cool content that they’ll dig. Articles, blog posts from your favorite bloggers, some movie news, etc. Celebirthdays: Is a celebrity that you love (and that your audience might love) having a birthday today? Post about it on social media! Your audience will appreciate that you thought of it, and it’s the thought that counts, right? Want to start an online business? Try Artist Shops for free! Hi, thanks for the article. Some nice tips! I was wondering about copyright so people don’t just print off our work or use it for marketing material or other? thanks for your advice! Because the designs in Artist Shops belong to the artists, not Threadless, we can’t really step in there. It’s up to each artist to copyright their own designs, then to take action if they find someone stealing their work!